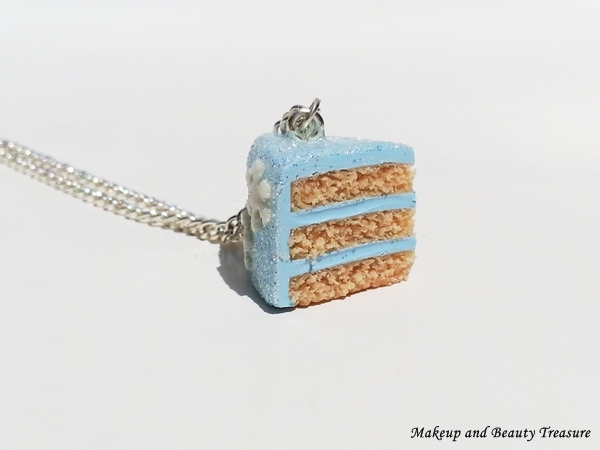 The moment I see food jewelries online, I just could not resist myself drooling over them. They look too cute and I literally feel like eating them. 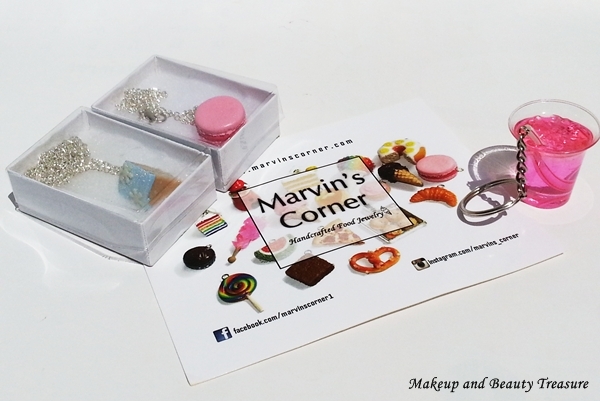 Recently I came across a very beautiful online shopping website that sells loads of miniature food jewelries with affordable price tags--- Marvin’s Corner*. Before starting the review let me tell you the owner of Marvin’s Corner Tiffany is way too polite, friendly and helpful. Though I feel like ordering all jewelries from Marvin’s Corner but then I controlled my senses and chose these three cute yet pretty items. All the items came perfectly bubble wrapped in a soft plastic packet. The necklaces were placed neatly over cotton pad in plastic cases with clear lids. The keychain was bubble wrapped and kept safely in a silver case. Fortunately I was not charged any custom duty! Marvin’s Corner charges only $10 for shipping internationally! 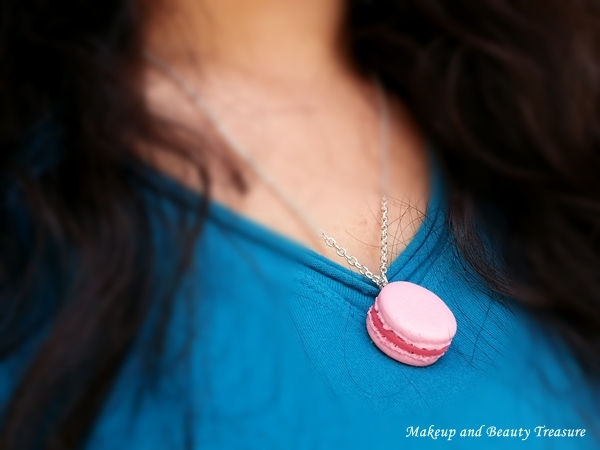 Why did I choose Macaron Necklace? I wanted to match it with THIS ring. Perfect jewelries to pair with my pink outfit! 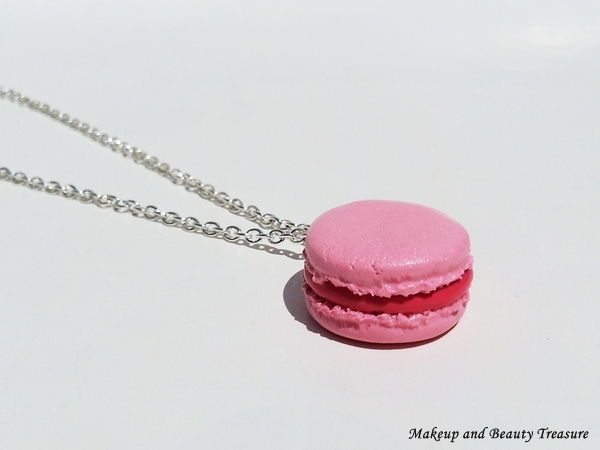 The pendant is a pink cute shape of macaron which looks very adorable on neck. It is made using polymer clay and is quite sturdy. I have dropped it once but it stays in perfect condition. 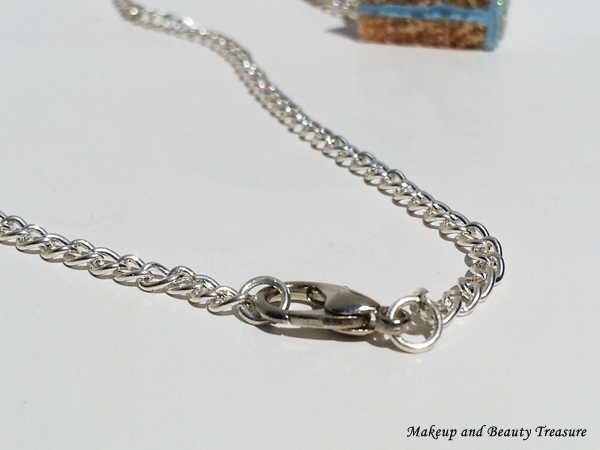 It has silver 18 inch link chain with a lobster clasp. 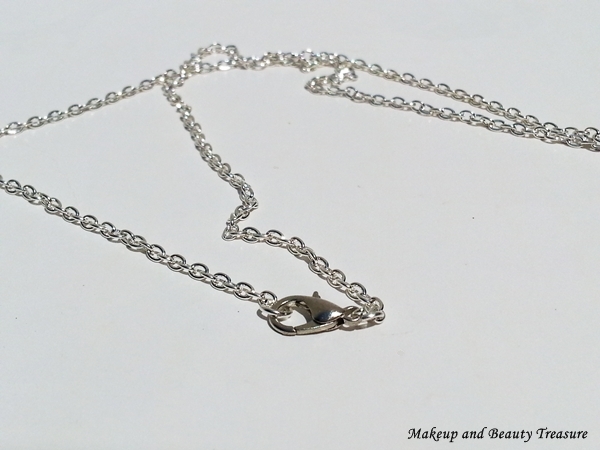 I love wearing it with my western outfits and it stays perfectly at the neck without dangling! The macaron looks real and makes me feel like eating it. 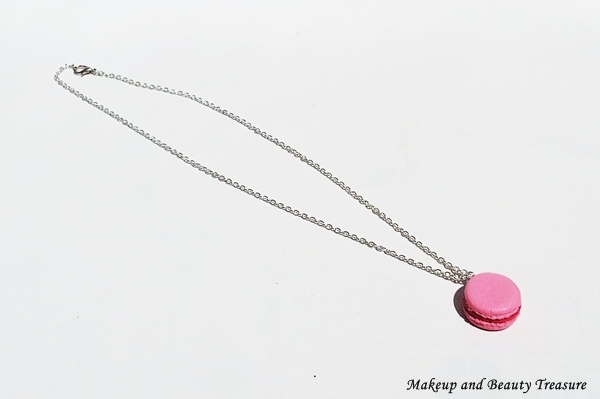 A yummy item in my jewelry collection! It is worth $15 and you can buy online HERE. I totally loved this necklace. It not only looks yummy but also delicate to wear. 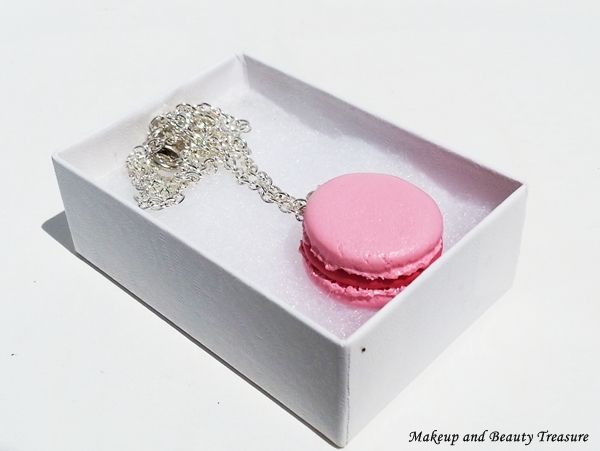 I got the necklace in long chain but now it is available in short chains that I got in macaron necklace. It has gorgeous shimmers and snowflakes over it that makes it perfect to wear in winter seasons and of course during Christmas! 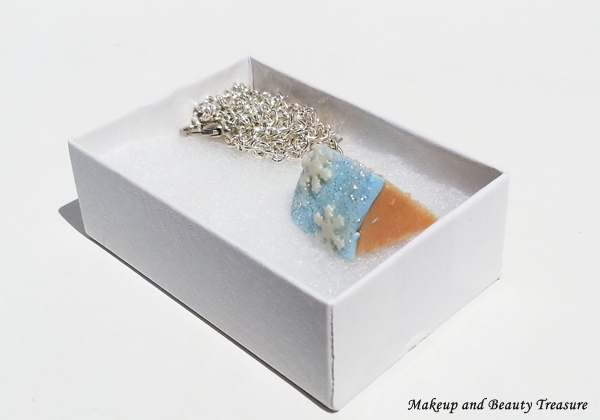 It is also made of polymer clay and has a great finish. 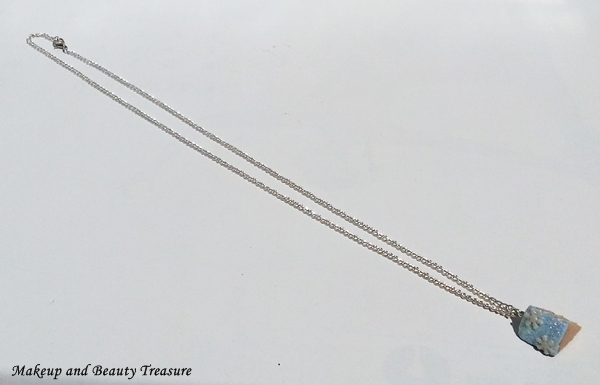 The chain is of very good quality with a lobster clasp that makes it pretty easy to wear it yourself! 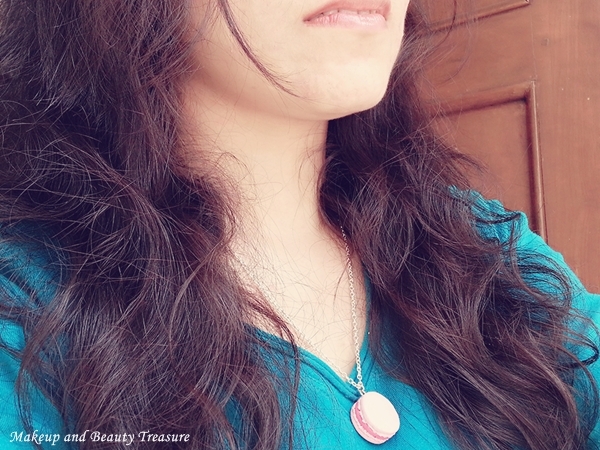 I am definitely saving this necklace for winters as it will look awesome with high collared sweaters or jackets! It is also priced at $15 and you can buy online HERE. This is the cutest keychain I own. I love hoarding cute key chains but this is my favorite of all. 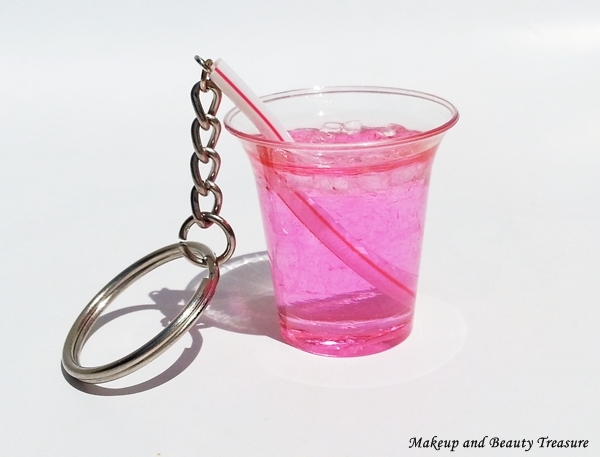 Pink has been my recent obsession and I loved this keychain to the core. It does look like a real drink in person with a straw! It reminded me of drinks I used to take with my friends when we bunk our classes! It is priced at $13 and you can buy online HERE. It comes in various colors so you can always choose your favorite color! Definitely a perfect gift for your friend too! By the way, my nephew thought of it as real drink and put his lips on the straw! • Comes in cases so you can store your jewelries safely! • Looks like real food! • Great quality and finish. • Feels very light on neck. • The chain is of good quality and does not cause irritation. • Marvin’s Corner provides International Shipping. Marvin’s Corner stocks really cute food jewelry, key chains and charms. I totally loved the quality of their items with an affordable price tag. If you are fond of quirky food or dessert items then I would highly recommend Marvin’s Corner to you! Definitely one of my favorite food jewelry websites and I look forward to trying out their earrings and other necklaces. 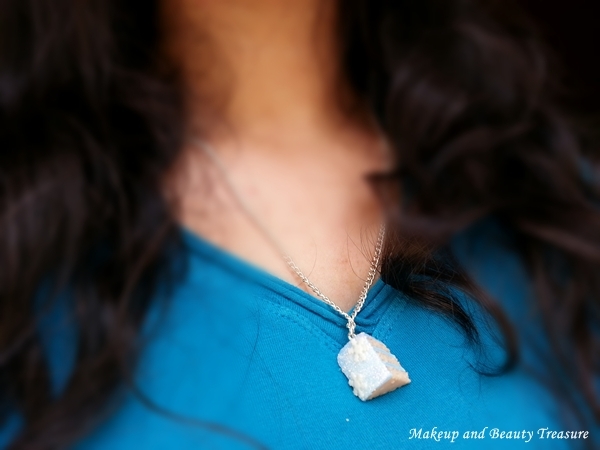 • Clean the jewelry with a soft cloth after usage. • Store it properly in jewelry cases. I store them in the cases I got from Marvin’s Corner! • Keep your jewelries away from perfumes or makeup! What item did you like the most from Marvin's Corner? Hai na Bushu? I love cute things!